BCAction’s Information & Resources program remains a valuable resource for people recently diagnosed or otherwise affected by breast cancer. Since January 2013, we have responded to over 235 people on topics that range from treatment issues, financial crisis, anti-fracking and breast cancer cause-marketing. 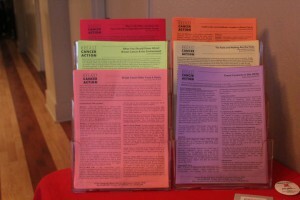 Each factsheet offers a general overview and framing of the topic, a foundation of science-based information along with BCAction’s perspective on the topic. We encourage you to share these factsheets, available in PDF format, with friends, family, co-workers and your larger community. 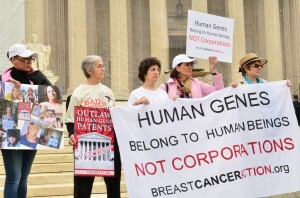 BCAction members rally to outlaw human gene patents during oral arguments at the Supreme Court in April. On April 15, 2013, the U.S. Supreme Court heard oral arguments in our landmark case challenging Myriad Genetics’ patents on the human “breast cancer” genes, BRCA1 and BRCA2. BCAction’s Executive Director Karuna Jaggar was one of only 15 members of the public to get one of the coveted tickets and made it inside the courtroom to observe the oral arguments. While she was inside, BCAction hosted a rally outside on the steps of the Supreme Court alongside over 50 activists from 14 states joining us on behalf of women’s health and taking a stand against corporate control of our genes. 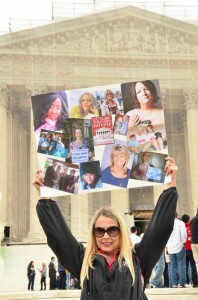 We held up signs and pictures of our loved ones who couldn’t be there, we shared compelling stories about why we believe human gene patenting is wrong and why the Supreme Court must correct this wrong. On June 13, 2013, the Supreme Court did just that. They ruled to strike down Myriad Genetics’ patents on the human “breast cancer” genes, BRCA1 and BRCA2—and not just Myriad’s patents on human genes, but patents on all naturally occurring genes! This was a tremendous win for women’s health – and for all our health. And to think, four years ago when we first filed this suit alongside our partners at the ACLU, many experts in the field said the case was frivolous and could not be won! Like that has ever stopped us. In the months following the Supreme Court’s decision, we have kept a close eye on the field of BRCA testing. We’re the watchdog, it’s what we do. And lo and behold, Myriad Genetics is responding to their loss at the Supreme Court by spending hundreds of thousands of dollars (most of which have come from their BRCA testing monopoly) filing lawsuits to block the competition from releasing additional genetic tests into the marketplace. In other words, Myriad is working hard to preserve their monopoly (for more on our role in this see Testing and Treatment). In early May, we sent out an e-alert to all our members urging you to take action for safe chemicals by sending letters to Senators asking them to support the Safe Chemicals Act of 2013. Only a few weeks later, the significantly weaker Chemical Safety Improvement Act (CSIA) was introduced – which changed the landscape for chemical regulation advocacy. In June, we were among the first organizations to take a public stand against the CSIA, via a blog post and an e-alert demanding that Senators oppose the weaker bill unless and until substantial improvements were included to protect the public from toxic chemicals in our daily lives. We continue to monitor the legislative process for both the Safe Chemicals Act and the Chemical Safety Improvement Act, and we are committed to ensuring that only the strongest legislation moves forward. In September, BCAction signed on to a letter from a number of health-oriented groups addressed to ranking members of the U.S. Senate Environment and Public Works Committee to express concerns about the Chemical Safety Improvement Act’s failure to adequately address health concerns regarding toxic chemical exposures. This year’s Think Before You Pink Campaign – Toxic Time Is Up generated over 32,000 petition signatures urging the Senate Environment and Public Works Committee to take action and pass only the strongest TSCA reform. These signatures represent a tidal wave of support for strong TSCA reform – and we intend to leverage them to keep the pressure on legislators and continue to build momentum for meaningful chemical safety reform. In September, California Assembly Member Joan Buchanan introduced bill AB49, which if passed, would introduce a breast cancer awareness license plate program for the state of California. A pink ribbon license plate! Needless to say, we had concerns and we addressed them with Assembly Member Buchanan directly. The language on the proposed pink ribbon license plate, “early detection saves lives” is misleading to many women and factually inaccurate. The revenue generated from the Pink Plate program funds only breast cancer screening, and not follow-up treatment, care nor counseling for low income women. Since we are an activist organization, we gave BCAction members in California an opportunity to express concerns about the Pink Plate as well. Two hundred and sixty of our members joined us to demand that the license plate language and beneficiaries be changed to better address the needs of women living with and at risk of breast cancer. We had an overwhelming response to our September “Pinktober” email offering people options for engaging in October in non-pink product ways. One option was to host a community screening of Pink Ribbons, Inc. and over 50 members contacted us to find out more. In October and November, in a show of community spirit you all rose to the challenge. We hosted 22 screening of Pink Ribbons, Inc. from Texas to New York to Washington to Kansas to Michigan to California. Staff, Board and member speakers participated in almost half of the screenings to facilitate discussions after the film and answer questions. Our members are our strength and we value the involvement of grassroots activists throughout the country and around the world. 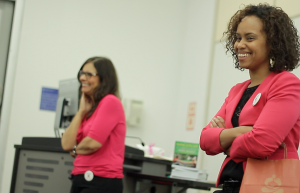 Our pilot program, which began October 2012, is comprised of diverse BCAction members across the U.S. The program now has twenty-six women who, with support and training from Breast Cancer Action, serve as leaders in their communities facilitating discussions and providing education and outreach at health/community fairs, house parties and other community events. Since the program’s inception, speakers have organized and participated in almost 40 community events all across the country. For more information about the program or to join, please contact Sahru Keiser at 415-243-9301 x14 or skeiser@bcaction.org. During 2013, our anti-fracking work really took off. 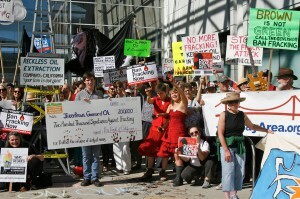 We are proud to be a founding member of the Americans Against Fracking coalition, addressing fracking nation-wide. The links between fracking and breast cancer are cause for serious concern and we posted materials on this issue on our website. In August, we targeted the Bureau of Land Management (BLM) demanding no expansion of fracking on public lands across the United States. And we were proud of our members for their role in generating over 1 million comments to the BLM from people everywhere who stand against fracking. As the comments were being delivered to Washington, DC, the coalition held a press conference and our eye-catching anti-fracking logo was prominently displayed in coverage of the event. We are thrilled by the enormous success of this campaign and remain committed to playing a leadership role in the anti-fracking movement. BCAction staff and members join other activists in Oakland, CA to send a message to Governor Jerry Brown: ban fracking now! 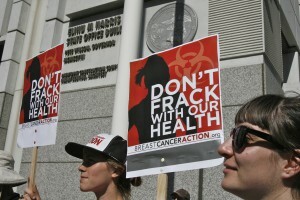 Breast Cancer Action endorsed and participated in the 2nd annual Global Frackdown on October 19th in Oakland, CA and our signs and campaign logo were enthusiastically held high by many of the attendees! We joined with thousands of individuals and organizations around the world to demand an end to this inherently dangerous method of extracting oil and natural gas. No sooner were we back from the Global Frackdown, we were back in action collecting petition signatures urging the U.S Bureau of Land Management to ban fracking on public lands in California and signed on to a letter to the U.S. Department of the Interior State Director, Jim Kenna, to demand additional public hearings regarding fracking on public lands in California. Phew! It’s been a busy year. And thanks to the generous ongoing support of individuals like you, we can continue to do this important work to address and end breast cancer—much of which involves going toe-to-toe against corporate giants with extremely deep pockets!